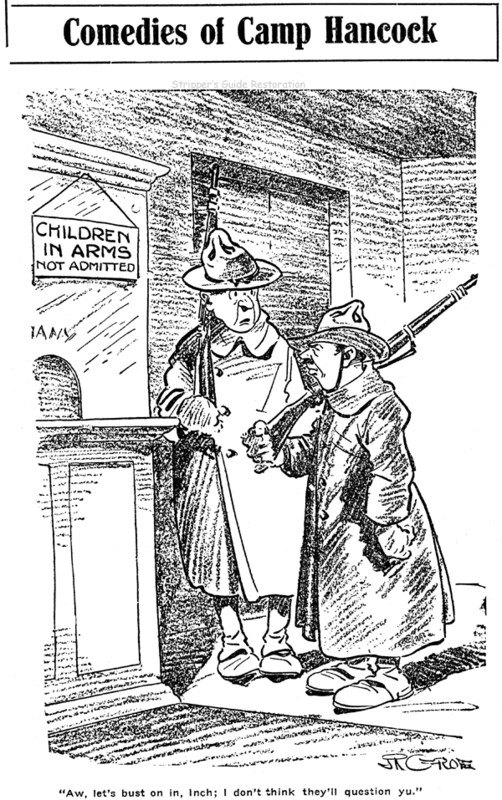 Putting the Grin into the Fight was a fairly good but not outstanding panel cartoon series about soldiers in World War I. What was indeed very, very good was the marketing gimmick used on the feature that had newspaper readers snookered back then, and still has people misunderstanding this series almost a hundred years later. First, though, some general explanation, because this is a pretty weird series all around. Though above I called the series Putting the Grin into the Fight, that title is just one of the common ones. The feature actually went through three phases -- first the early cartoons about basic training, then second, cartoons about actually fighting in Europe, and finally, cartoons about returning home. In each phase the series went by various names. For example, during the period when the feature was set in the European battlefront, it was often titled Over There with the Yanks. 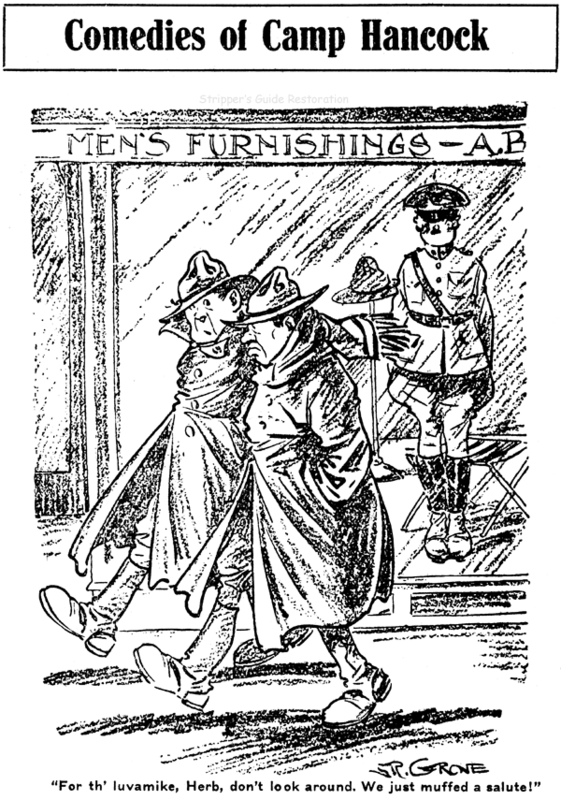 Later on it was Coming Home with the Yanks, then finally, Sketches About Town (resettling into normal life). When the series started, in January 1918 or perhaps a little earlier (I haven't been able to determine exactly since the N.E.A. archives are missing the entirety of this series), it seems to have been offered with two title options. There was Putting the Grin into the Fight, and Comedies of Camp [fill in the blank]. And there's the marketing gimmick. If your newspaper was published anywhere near a military camp, you were supposed to personalize the feature with its name. You can see that concept in action on the top two samples, which came from the Augusta Herald newspaper. Augusta Georgia was near Camp Hancock. Now that seems like an innocent enough little ruse, but it worked a little better than intended. 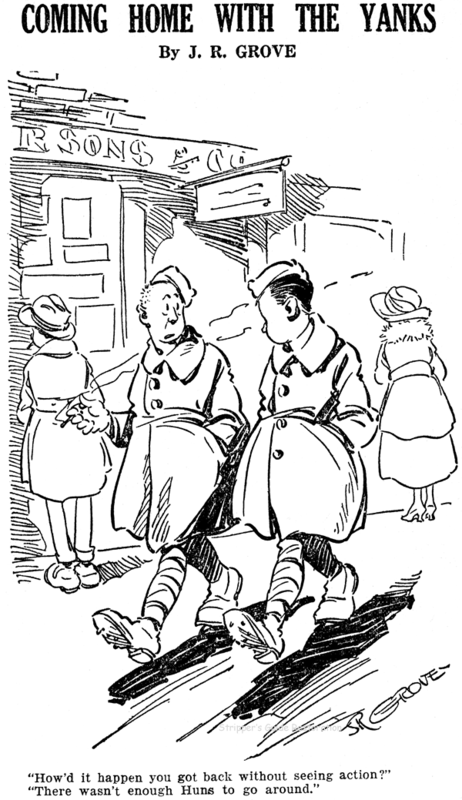 Newspaper readers, especially the boys in camp, sometimes got pretty stoked up about the idea that a real life cartoonist was in their midst, drawing cartoons for the local paper. Naturally some ambitious types sought out this fellow, J.R. "Roy" Grove, only to find it hard to pin him down. There's no telling how many newspaper editors had to sheepishly admit to puzzled inquirers that Mr. Grove was not at the camp at all, but was safely ensconced in his bullpen seat at N.E.A. in Cleveland. The ruse worked so well that it is still working a century hence. 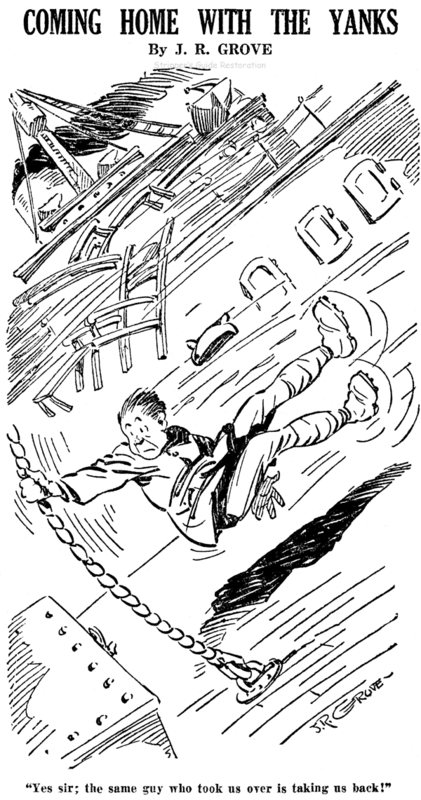 I have been contacted on two occasions by historians anxious to learn more about this fellow Grove, who drew boot camp cartoons for their local papers. Ouch! In fairness to Grove, he wasn't always at his drawing board in Cleveland. He does seem to have gone to Europe to do the cartoons set there, or at least in his signature he often adds a location in France. Whether he was there as a combatant or not I don't know. ...But I bet we'll know more tomorrow, because I believe Mr. Grove is going to get the Ink-Slinger Profile treatment by Alex Jay.